Invisalign® is a virtually invisible way to straighten your teeth using a series of clear, removable aligners that are custom-made for you. 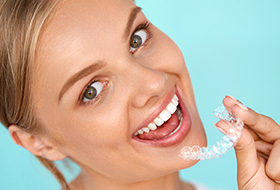 Invisalign® is a series of clear aligners made of plastic. Unlike traditional braces, you will be able to enhance your smile discreetly. Each aligner is worn for approximately two weeks and is meant to have a minimal impact on your lifestyle while straightening your teeth. Each aligner is custom-made for your teeth and is meant to move them little by little until the desired position of your teeth is achieved. Once we decide that Invisalign® is the right option for you, we will begin by taking X-rays and photos of your smile. From there, an impression of your teeth is taken. After we have the X-rays, photos, and impressions, we create a custom treatment plan using the Invisalign software. Each patient has a plan customized to reach the best results for their smile. Once a plan is established, you will receive 20 to 30 aligners that will be worn for approximately two weeks each. Every patient’s solution varies and with that, so do the number of weeks of treatment. One of our favorite things about Invisalign® is that we can virtually view your treatment plan and the final results prior to beginning your treatment. Contact us today at 412-854-2310 for a no-obligation consultation. Dr. Dan Rairigh is always looking to go through treatment options with new patients!